On our New Mexico road trip we got a lot of recommendations on things to see and do and eat. All three of us had been to NM before, so we enjoyed trying new places and activities. 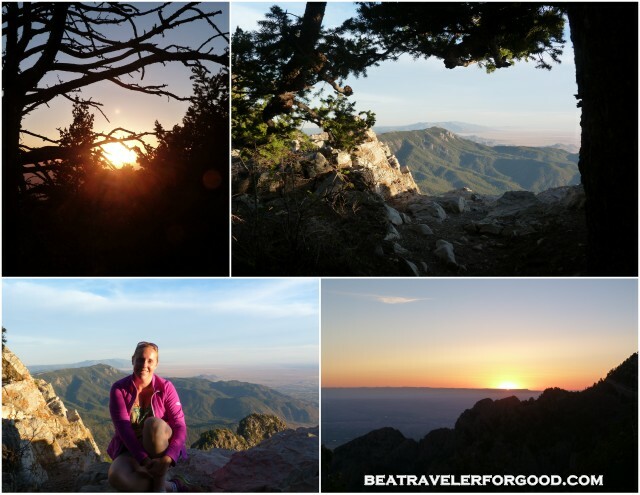 One of the volunteers at Tamaya Horse Rehab had recommended taking the Sandia Peak Tram to watch the sunset. We got on the tram somewhere between 7 and 7:30pm and got to enjoy the sunset in full glory from the top. Random piece of trivia: Sandia means watermelon in Spanish. The sun washes the peak this beautiful watermelon red color. I learned this fun fact on day 1 and was able to bust it out more than once to impress people the rest of the weekend. You are going up to the top of the mountain. 10,378 feet to be exact. A place where people ski in the winter. It is about 30 degrees cooler than the hot desert climate at the base. At the base it's hot. You're wearing your summer play clothes. You might even be sweating and turning the same watermelon red color as the mountain. You think: there is no way that I will be cold at the top of Sandia Peak. Think again. Considering wearing pants. Definitely bring sleeves. When the sun goes down (like it does every night), the temp drops dramatically. You will be a sad traveler in your shorts, tank top and flip flops when this happens. The tram comes every 15-20 minutes. We went up on the Sunday night of a holiday weekend. They told us before we ever went up that it was an hour to hour and a half wait to come down. Plan to do something at the top. Take a picnic. Read a book. Soak in the beauty. Go for a hike. Pose for silly prom-style family pictures. Grab a cocktail at High Finance. It may be a waste of your $20 (per person) to wait to go up, take 3 sunset photos and then wait to go down, all while doing the "I'm freezing cold dance" in your summer clothes.